One of the things I enjoy most about being a mom is sharing my favorite books with my kids. It's almost like I get to experience those stories for the first time all over again. My kids' excitement (or anticipation) (or fear) (or disgust) become mine, and it's absolutely delightful. Unless . . . they don't like the book. That happened with The Miraculous Journey of Edward Tulane by Kate DiCamillo. And also with The Saturdays by Elizabeth Enright. In both cases, it wasn't so much that they didn't like the books but just that I'd jumped the gun a bit and introduced them a little too early when they were too young to really understand and appreciate them. 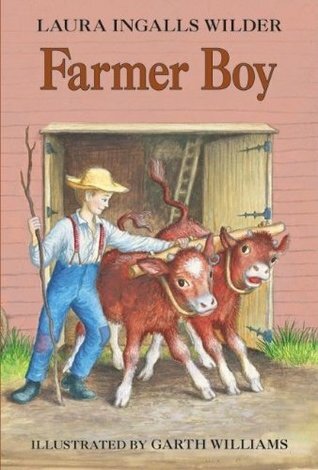 Because of those two fails, I've been worried about when to read another favorite of mine: Farmer Boy. I'd almost picked it up several times before but let it go a few months longer. But then, as this year's holiday season approached, I knew it was either now or wait another year (it's just such a good book to read around Thanksgiving and Christmas). And so we went for it. But not before I clutched the book to my chest and told Aaron and Maxwell, "This is one of my very favorite books. You have to like it." Bad form, I know. Luckily, they pretty much ignored my plea and just let the story work its own magic, which it did. Farmer Boy is the only book in the Little House series that stars Almanzo Wilder (Laura's future husband). His growing up years were completely different from Laura's. He grew up on a farm in New England--a very stable and secure farm. His father loved his farm and had no intention of going anywhere. He definitely didn't have the same wanderlust bug that Charles Ingalls had. Their farm is very prosperous, and they are incredibly self-sufficient. They make money by raising and selling horses, as well as potatoes, hay, and grain, but I kind of wondered what they were spending that money on. They raise everything they eat. They make everything they wear. They build everything they use. Money for them seems purely for pleasure and not for survival. Almanzo is the youngest, coming after Royal, Eliza Jane, and Alice. Unlike Royal, who plans to be a storekeeper one day, Almanzo loves the farm, and especially the horses. Almanzo wants so badly to help break Starlight, the youngest colt, but his father won't let him go near him. Almanzo is only nine years old and can't be trusted yet not to teach the colt bad habits. Through the year, he gradually earns that trust by breaking a young head of oxen he gets for his birthday and raising his own pig and helping haul wood and a dozen other things. His father sees his hard work and maturity and finally trusts Almanzo with the very thing he's been longing for. The book begins a little intense (scary or exciting, depending on how you look at it). There is a new teacher, Mr. Corse, and the big boys in the school are determined to thrash him and throw him out just like they have the previous two teachers. These are not just obnoxious or disruptive boys. They are tough and violent. They hurt one of the other teachers so badly that he later died. They aren't the type of boys to take lightly, yet Mr. Corse knows he has to firmly set rules and boundaries right from the beginning or they will never be satisfied and will continue to demand their own way. I have to admit, I'd forgotten about this opening story. It's interesting how everything takes on a different hue when you're sharing it with your kids. I was a little worried it might traumatize them and make them afraid to go to school. But not at all. They viewed those bullies the same way they do all villains: as someone to be defeated. So the showdown between Mr. Corse and the bullies was extremely exciting, and Mr. Corse got the upperhand, which was very satisfying. Our favorite chapter was "Keeping House" where Mother and Father leave for a week and put Royal and Eliza Jane in charge. As you might expect, they really live it up the first few days. They make ice cream and candy using the white sugar, which is supposed to be kept for special occasions only. They let the house and the garden go and spend their days fishing and playing. Then one morning, they wake up and realize that Mother and Father will be home soon. In a frenzy, they begin cleaning and putting things in order. Almanzo gets so tired of being bossed around that he and Eliza Jane have a little shouting match which ends when Almanzo throws his blacking brush at the parlor wall, leaving an ugly black splotch. He is horrified by what he's done and dreads Mother finding out. After she comes home and is so pleased to find everything else in order, it says, "He did not want her to know about the black splotch, and yet he wished she did know. When the worst was over he could stop dreading it." That is the perfect description of guilt--it eats away at you and makes it so you can't focus on or enjoy anything else. Those of you who have read the book will remember what finally happens, and I won't spoil it for the rest of you because it is one of the best scenes in the entire book. My kids were so anxious and worried before finally breathing a sigh of relief. "There was another day of the Fair, but it wasn't so much fun. Almanzo was tired of having a good time. Three days of it were too much. It didn't seem right to be dressed up again and leaving the farm. He felt unsettled, as he did at house-cleaning time. He was glad when the Fair was over and everything could go on as usual." Or this one, when Almanzo and his father are threshing wheat and Almanzo wonders why they don't use a machine to do it. His father explains, "All it saves is time, son. And what good is time, with nothing to do? You want to sit and twiddle your thumbs, all these stormy winter days?" Lately, Maxwell has been waxing eloquent on work, and I have to wonder if it's a direct result of reading this book. After doing his chores, he says things like, "I feel so good after I work" and "Work gives me energy." That's definitely the feeling you get from reading Almanzo's story: work is something to enjoy not endure, to take pride in and feel grateful for. As much fun as it is to laze around, the real satisfaction comes from accomplishing meaningful things, and I think my kids are slowly beginning to realize that. Another thing they're realizing is how easy and posh of a life they have. They're not getting up at four o'clock in the morning to take care of the stock. They're not spending all day cutting ice or hauling timber. They're not heating water on the stove so they can take a bath once a week (although, a couple of Sundays ago, we ran out of hot water, and Aaron hadn't taken a shower yet. Mike heated up some water in the microwave, and we joked that it was a Farmer Boy shower even though it wasn't anything close to one). This is why reading is the perfect pastime. Through stories, they can learn about a different time and way of life and gain a deeper appreciation for their own lives. And then, of course, I can't end this review without mentioning the food. The descriptions of food in this book are agonizingly vivid. On more than one occasion, after hearing about the doughnuts and pies Almanzo was scarfing down, Aaron moaned, "Oh, I'm soooooo hungry." They definitely eat well, that Wilder family. We haven't read any of the other books in the Little House series yet. I purposely started with this one because I thought it was more exciting and interesting than Little House in the Big Woods. But now they're hooked, and I know they'll enjoy the rest of the series (but I'm a little sad that this is the only one that stars young Almanzo). Which book is your favorite in the series? Would you start with this one or do you think the series should be read in order? Hi Amy! Just wanted to say I enjoy reading your blog and you inspired me to get the first three books of the Little House series from the library last week.They are as sweet as I remember them! My daughter is 8 months old, so it will be a little while before we enjoy them together, but I cant wait! Thanks, Denise! I didn't read most of the series until I was an adult, but reading them to my kids has made me feel a little like I'm experiencing them as a kid! We read The Little House in the Big Woods last year and it was a big hit with my kids. I thought it would be slow for them, but even Caleb really enjoyed it. Now I am trying to decide whether to read Little House in the Prairie or Farmer Boy next... decisions, decisions. It sounds like I need to overcome some of my personal inhibitions with Little House in the Big Woods and read it to my kids!